We recently purchased the MTD Yard Man Riding Mower and it has changed my whole perception of mowing the lawn! When we purchase a new home with over 3 acres of land, my husband said the push mower was history! We shopped around and tried out a lot of other riding mowers before deciding on the MTD brand. One of our neighbors has one and recommended it. We also read a consumer report that said they were well made and affordable. 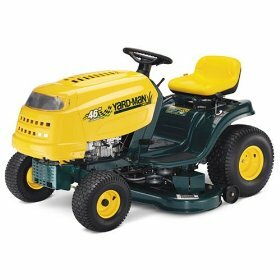 The MTD riding mower we purchased, the Yard Man 13AO771H055, is easy to use, it’s like driving a car, just turn it on and go. You can change gears to go faster or slow down and reverse while you are driving. It has a comfortable adjustable seat and lots of safety features like automatic stop when you take your foot off the pedal. It’s not loud and noisy like a lot of other mowers we tried and the ride and turns are smooth. It’s so easy to maneuver my 11 year old can use it (with supervision of course). The mower is a little pricey in my opinion but worth every penny because it does the job fast and easy. Mowing the lawn is no longer a "man's job" in my family. Are you nuts??? MTD IS THE WORST MOWER IN THE LAND!!! You mentioned a little pricey, i can't find prices for it anywhere, how much does this retail for?